For ither uises, see Karlsruhe (disambiguation). Karlsruhe (German pronunciation: [ˈkaʁlsˌʁuːə]; umwhile Carlsruhe) is the seicont-lairgest ceety in the state o Baden-Württemberg, in soothwast Germany, near the Franco-German border. It haes a population o 296,033. Karlsruhe Palace wis biggit in 1715 an the ceety is nou the seat o twa o the heichest courts in Germany, the Federal Constitutional Court an the Federal Court o Juistice. It haes been speculatit that Karlsruhe wis a model for Washington, D.C. as baith ceeties hae a centre frae which the streets radiate ootwaird. The ceety lees at an altitude atween 100 m (on the eastren shore o the river Rhine) an 322 m (near the communications touer. In the suburb o Wettersbach). Its geographical coordinates are 49°00′N 8°24′E﻿ / ﻿49.000°N 8.400°E﻿ / 49.000; 8.400; the 49th parallel rins throuch the ceety centre. Its course is merked bi a stane an painted line in the Stadtgarten ("ceety park"). The ceety wis planned wi the palace touer (Schloss) at the centre an 32 streets radiating oot frae it lik the spokes o a wheel, or the ribs o a folding fan, sae that ane nickname for Karlsruhe in German is the "fan ceety" (Fächerstadt). Naur aw o thir streets survived til the day. Acause o this ceety layout, in metric geometry, Karlsruhe metric refers tae a meisur o distance that assumes traivel is anerly possible alang radial streets an alang circular avenues aroon the centre. The ceety centre is the auldest pairt o toun an lees sooth o the palace in the quadrant defined bi nine o the radial streets. The central pairt o the palace rins east-wast, wi twa wings, ilk o thaim at a 45° angle, direckit southeast an southwest (i.e., parallel wi the streets markin the boundaries o the quadrant definin the ceety centre). The mercat square lees on the street rinnin sooth frae the palace tae Ettlingen. The mercat square haes the town hall (Rathaus) tae the wast, the main Lutheran kirk (Evangelische Stadtkirche) tae the east, an the tomb o Margrave Charles III William in a pyramid in the buildings, resultin in Karlsruhe bein ane o anerly three muckle cities in Germany whaur buildings are laid oot in the Neoclassical style. The aurie north o the palace is a park an forest. Oreeginally the aurie tae the east o the palace consisted o gardens an wids, some o it remainin, but the Karlsruhe Institute o Technology (foundit in 1825), Wildparkstadion, an residential auries hae been biggit thare. The aurie wast o the palace is nou maistly residential. Panorama o Karlsruhe, leukin sooth frae the palace touer. The Institute o Technology is on the left, the Market square in the centre, the Federal Constitutional Court on the right. Note wings o the palace alignin wi streets, aw radiatin oot frae the centre o toun (i.e., the palace touer). 180 degree panorama frae atop the palace touer, facin north. Karlsruhe experiences an oceanic climate (Köppen climate classification Cfb) seemilar tae a fair bit o Germany. In comparison, Karlsruhe features het simmers an average tae mild winters. The ceety is ane o the warmest an sunniest in Germany. Precipitation is awmaist evenly spread atouer the year. 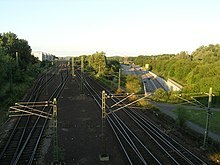 In 2008, the mair nor 130 year-auld wather station in Karlsruhe wis closed, that is replaced bi a wather station in Rheinstetten, sooth o Karlsruhe. Accordin tae legend, the name Karlsruhe, that translates as Charles’ repose, wis gien tae the new ceety efter a huntin trip whan Charles III William, Margrave o Baden-Durlach, woke frae a dream in that he dreamt o foundin his new ceety. Charles William foundit the ceety on Juin 17, 1715, efter a dispute wi the ceetizens o his previous caipital, Durlach. The foundin o the ceety is close linkit tae the construction o the palace. Karlsruhe became the caipital o Baden-Durlach an in 1771 o the unitit Baden til 1945. Biggit in 1822, the "Ständehaus" wis the first parliament biggin in a German State. In the eftercome o the democratic revolution o 1848, a republican govrenment wis elect here. A fair bit o the central aurie, includin the palace, wis reduced tae rubble bi Allied bombing durin Warld War II but wis biggit again efter the war. Locate in the American zone o the post-war Allied occupation, Karlsruhe wis hame tae an American military base, established in 1945. In 1995, the bases closed an thair facilities war turned ower tae the ceety o Karlsruhe. The Stadtgarten is a recreational aurie naur the main railwey station (Hauptbahnhof) an wis biggit again in 1967 durin the 'Federal Garden Shaw' (Bundesgartenschau). It is the site o Karlsruhe Zoo an aa. The Durlacher Turmberg haes a leuk-oot touer (hence its name). It is a umwhile keep datin back tae the 13t century. The ceety haes twa botanical gardens: the municipal Botanischer Garten Karlsruhe that forms pairt o the Palace complex, an the Botanischer Garten der Universität Karlsruhe which is maintained bi the varsity. Panorama o the close o Botanischer Garten Karlsruhe. The Marktplatz haes a stane pyramid markin the grave o the ceety's founder. Biggit in 1825, it is the emblem o Karlsruhe. The ceety is eiknamed the fan ceety (Die Fächerstadt) acause o its design layout, wi straucht streets radiating fan-lik frae the Palace. The Karlsruhe Palace (Schloss) is a interestin piece o airchitectur; the adjacent Schlossgarten includes the Botanical Garden wi a palm, cactus an orchid hoose, an walkin paths throuch the wid tae the north. The sic-cried Kleine Kirche (Little Kirk), biggit atween 1773 an 1776, is the auldest kirk o Karlsruhe's ceety centre. The architect Friedrich Weinbrenner designed mony o the ceety's maist important sights. 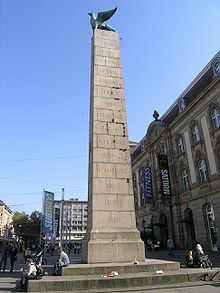 Anither sicht is the Rondellplatz wi its 'Constitution Building Columns' (1826). It is dedicate tae Baden's first constitution in 1818, that wis ane o the maist liberal o its time. The Münze (mint), erected in 1826/27, wis an aa biggit bi Weinbrenner. The St. Stephan parish kirk is ane o the masterpieces o neoclassical kirk airchitectur in Southern Germany. Weinbrenner, wha biggit this kirk atween 1808 an 1814, orientated it tae the Pantheon, Rome. The neo-gothic Grand Ducal burial chapel, biggit atween 1889 an 1896, is a mausoleum rather than a kirk, an is locatit in the middle o the forest. The main cemetery o Karlsruhe is the auldest park-lik cemetery in Germany. The crematorium wis the first tae be biggit in the style o a kirk. Karlsruhe is hame tae a Museum o Natural History an aa, an opera hoose (the 'Baden State Theatre'), in addition tae a nummer o independent theatres an art galleries. The State Art Gallery, biggit in 1846 bi Heinrich Hübsch, displays pentins an sculptures frae sax centuries, parteecularly frae France, Germany an Holland. Karlsruhe's newly renovated art museum is ane o the maist important art museums in Baden-Württemberg. Further cultural attractions are scattered atouer Karlsruhe's various incorporated suburbs. The Scheffel Association or literary society (established in 1924), is the mucklest literary organisation in Germany. [citation needit] Thir days the Prinz-Max-Palais, biggit atween 1881 an 1884 in neoclassical style, houses the organisation an includes its museum. 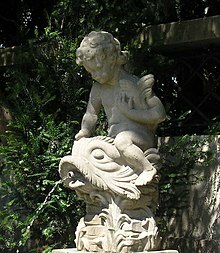 Due tae population growthe in the late 19t century, Karlsruhe developed several suburban auries (Vorstadt) in the Gründerzeit an inspecially art nouveau styles o airchitectur, wi mony preserved examples. Anither tourist attraction is the Centre for Art an Media (Zentrum für Kunst und Medientechnologie, or ZKM), that is locatit in a converted ammunition factory. 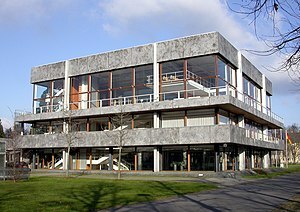 Karlsruhe is the seat o the German Federal Constitutional Court (Bundesverfassungsgericht) an the heichest Court o Appeals in civil an criminal cases, the Bundesgerichtshof. The courts came tae Karlsruhe efter Warld War II, whan the provinces o Baden an Württemberg war merged. Stuttgart, caipital o Württemberg, became the caipital o the new province (Württemberg-Baden in 1945 an Baden-Württemberg in 1952). In compensation for the state authorities relocated tae Stuttgart, Karlsruhe applied tae acome the seat o the heich court. Germany's mucklest oil refinery is locatit in Karlsruhe, at the wastren rand o the ceety, directly on the river Rhine. The Technologieregion Karlsruhe is a loose confederation o the region's cities for tae promote heich tech industries; the day, aboot 20% o the region's jobs are in research an development. EnBW, ane o Germany's muckle maist electric utility companies an a revenue o 19.2 billion € in 2012, is headquartered in the ceety. Due tae the University o Karlsruhe providin services til the late 1990, Karlsruhe became kent as the internet capital o Germany. [citation needit] The DENIC itsel, Germany's Network Information Centre, haes syne muived tae Frankfurt, whaur DE-CIX is locatit. Twa major internet service providers, WEB.DE an schlund+partner/1&1, nou baith owned bi United Internet AG, are locatit at Karlsruhe. The Stadtwiki Karlsruhe is the mucklest ceety wiki in the warld. The leebrar o the Karlsruhe Institute o Technology developed the Karlsruher Virtueller Katalog, the first internet site that alloued researchers warldwide (for free) tae search multiple leebrar catalogues warldwide. In the year 2000 the regional online "newspaper" ka‑news.de wis creautit. As a daily newspaper, it disnae jist provides the news, but an aa informs readers aboot upcoming events in Karlsruhe an surroondin auries. The Verkehrsbetriebe Karlsruhe (VBK) operates the ceety's urban public transport network, comprising seiven tram routes an a network o bus routes. This network is weel developed an aw ceety auries can be reaked roun the clock bi tram an a nicht bus seestem. The Turmbergbahn funicular railwey, tae the east o the ceety centre, is operated bi the VBK an aa. The VBK is a partner, wi the Albtal-Verkehrs-Gesellschaft an Deutsche Bahn, in the operation o the Karlsruhe Stadtbahn, the rail seestem that serves a lairger aurie aroond the ceety. This seestem maks it possible tae reak ither towns in the region, lik Ettlingen, Wörth am Rhein, Pforzheim, Bad Wildbad, Bretten, Bruchsal, Heilbronn, Baden-Baden, an even Freudenstadt in the Black Forest right frae the ceety centre. The Stadtbahn is well kent in transport circles aroond the warld for pioneering the concept o operating trams on train tracks, tae achieve a mair effective an attractive public transport seestem, tae the extent that this is aften kent as the Karlsruhe model tram-train seestem. Karlsruhe is weel-connected via road an rail, wi Autobahn an InterCityExpress connections gaun tae Frankfurt, Stuttgart/Munich an Freiburg/Basel. Syne Juin 2007 it haes been connected tae the TGV network, reducin traivel time tae Paris tae anly three oors (previously it haed takken five oors). Twa ports on the Rhine provide transport capacity on cargo ships, especially for petroleum products. The nearest airport is pairt o the Baden Airpark (offeecially Flughafen Karlsruhe/Baden-Baden) aboot 45 km (28 mi) southwest o Karlsruhe, wi regular connections tae airports in Germany an Europe in general. Frankfurt International Airport can be reakit in aboot an oor an a hauf bi car (ane oor bi InterCityExpress); Stuttgart Airport can be reakit in aboot ane oor (aboot an oor an a hauf bi train an S‑Bahn). Twa interestin facts in transportation history are that baith Karl Drais, the inventor o the bicycle, in addition tae Karl Benz, the inventor o the automobile war born in Karlsruhe. Benz wis born in Mühlburg, that later became a borough o Karlsruhe (in 1886). Benz studied at the Karlsruhe varsity an aw. It is interestin that Benz’s wife Bertha teuk the warld's first lang distance-drive wi a car frae Mannheim tae Karlsruhe-Grötzingen an Pforzheim (see Bertha Benz Memorial Route). Thair professional lifes led baith men tae the neibourin ceety o Mannheim, whaur thay first applied thair maist famous inventions. Jews settled in Karlsruhe syne its foundation. Thay war attracted bi the numerous privileges granted bi its founder tae settlers, athout discrimination as tae creed. offeecial documents attest the presence o several Jewish families at Karlsruhe in 1717. A year later, the ceety council addressed tae the margrave a report whaur a quaisten wis raised as tae the proportion o municipal charges tae be borne bi the newly arrived Jews, wha formed an organized congregation in that year, wi Rabbi Nathan Uri Kohen o Metz at its heid. A document dated 1726 gies the names o twenty-fower Jews wha haed takken pairt in an election o municipal officers. As the ceety grew permission tae settle thare became less easy obtained bi Jews, an the community developed mair slowly. A 1752 Jewry ordinance stated Jews war forbidden tae lae the ceety on Sundays an Christian halidays, or tae gang oot o thair houses durin kirk services, but thay war exempted frae service bi court summonses on Sabbaths. Thay coud sell wine anerly in inns awned bi Jews an graze thair nowt, no on the commons, but anerly on the wayside. Karlsruhe wis the seat o the central council o Baden Jewry. The first chief rabbi o the kitnra Rabbi Asher Lowe wis frae (Durlach) Karlsruhe, Nethaneel Weil wis a rabbi in Karlsruhe frae 1750 til his deith. In 1783, bi a decree issued bi Margrave Charles Frederick o Baden, the Jews ceased tae be serfs, an consequently coud settle in whitever place thay pleased. The same decree freed thaim frae the "Todfall" tax, paid tae the clergy for ilk Jewish burial. In commemoration o thir chynges special prayers war prepared bi the actin rabbi Jedidiah Tiah Weill, wha, succeeding his faither in 1770, held the office til 1805. In 1808 the govrenment issued regulations concerning the admeenistration o the spiritual affairs o the Jewish community; bi that, the chief rabbi o Karlsruhe became the spiritual heid o the Jews o the country. Complete emancipation wis gien in 1862, Jews war elected tae ceety council an Baden parliament, an frae 1890 war appyntit judges. Jews war persecuted in riots occurring in 1819 an anti-Jewish demonstrations war held in 1843, 1848, an the 1880s. The weel-kent German-Israeli airtist Leo Kahn studied in Karlsruhe afore leaing for France an Israel in the 1920s an 1930s. The day, thare are aboot 900 members in the Jewish community; mony o thaim are recent immigrants frae Roushie, an an orthodox rabbi. 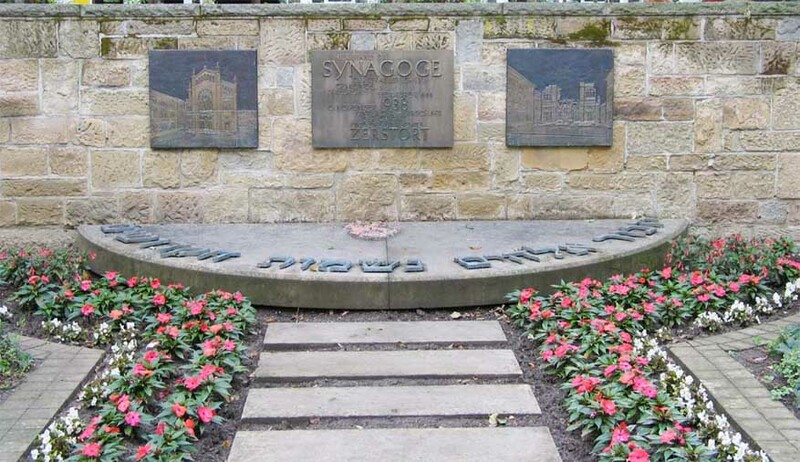 Karlsruhe haes memorialized its Jewish community an notable pre-war synagogues wi a memorial park. In 1933, 3,358 Jews stayed in Karlsruhe. The community awned buildings an property, lik twa synagogues, ane on Karl-Friedrich-Straße an ane on Kronenstraße, twa elderly ceetizens' hames, a Jewish scuil, a hospital, welfare institutions, an several Jewish cemeteries. Durin the first years o the Nazi regime, the community continued tae function, parteecularly tae prepare Jews for emigration. On October 28, 1938, aw male Pols Jews livin in Karlsruhe war deported tae Poland. Synagogues war destroyed on Kristallnacht, 9–10 November 1938. Maist o the men war arrested an sent tae Dachau concentration camp, but war released efter thay haed furnished proof that thay intendit tae emigrate. In October 1940, 895 Jews war expelled during Operation Wagner-Bürckel an interned bi the French Vichy authorities in Gurs in soothren France. Maist o thaim war then deported frae thare tae Auschwitz (via the Drancy deportation camp, on the outskirts o Paris) atween August an November 1942. Maist o the 429 remainin Jews an ither sae‑cried "non-Aryans" war deported tae the east atween 1941 an 1944. In 1945 thare war anerly 18 Jews in Karlsruhe. Mair nor 1,000 o thaim haed been killt atween 1933 an 1945. The Baden Central Jewish Council wis reorganized in 1948. A new synagogue wis biggit in 1969. Some 113 holocaust victims are commemorated bi brass plaques on Karlsruhe's sidewalks, the sae-cried Stolpersteine. Karlsruhe is a renowned research an study centre, wi ane o Germany's finest institutions o heicher education. The Karlsruhe University (Universität Karlsruhe-TH) is the auldest technical varsity in Germany in addition tae the home o the Forschungszentrum Karlsruhe (Research Center Karlsruhe), at which ingineerin an scienteefic research is performed in the auries o heal, earth, an environmental sciences. The Karlsruhe University o Applied Sciences (Hochschule Karlsruhe-HS) is the lairgest varsity o technology in the state o Baden-Württemberg, offerin baith professional an academic education in ingineerin sciences an business. On October 1, 2009, the University o Karlsruhe joined the Forschungszentrum Karlsruhe tae form the Karlsruhe Institute o Technology(KIT). The State Academy o Fine Arts Karlsruhe is ane o the weeest varsities in Germany wi average 300 students, but it is kent as ane o the maist significant Academies o Fine Arts. The Karlsruhe University o Arts an Design (HfG) wis foondit tae the same time as its sister institution, the Center for Art an Media Karlsruhe (Zentrum für Kunst und Medientechnologie). The HfG teaching an research focuses on new media an media art. The Hochschule für Musik Karlsruhe is a muisic conservatory that offers degrees in composition, music performance, education, an radio jurnalism. Syne 1989 it haes locatit in the Gottesaue Palace (see picture). The Karlshochschule International University (formerly kent as Merkur Internationale Fachhochschule) wis foundit in 2004. As a foundation owned state approved Management School Karlshochschule offers undergraduate education in baith German an Inglis focusin on international an intercultural management in addition tae service- an cultur-relatit industries. Mair outouer an international consecutive Master o Arts (postgraduate) in leadership studies is offered in Inglish. Karlsruhe hosts ane o the European Institute o Innovation an Technology's Knawledge an Innovation Communities (KICs) focussin on sustainable energy. Ither co‑centres are based in Grenoble, France (CC Alps Valleys); Eindhoven, the Netherlands, an Leuven, Belgium (CC Benelux); Barcelona, Spain (CC Iberia); Kraków, Poland (CC PolandPlus); an Stockholm, Swaden (CC Swaden). In 1999 the ZKM (Zentrum für Kunst und Medientechnologie, Centre for Art an Media) wis opened. Athin a short time, it biggit up a warldwide reputation as a cultural institution. Linking new media theory an practice, the ZKM is locatit in a umwhile wappens factory. Amang the institutes relatit tae the ZKM are the Staatliche Hochschule für Gestaltung (State University o Design), whase preses is philosopher Peter Sloterdijk an the Museum for Contemporary Art. 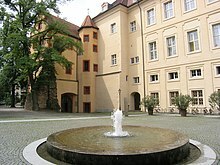 Gottesau Palace (nou music college). Ilka year in Julie, thare a muckle open air festival lastin three days cried Das Fest ("The Festival"). The Baden State Theatre haes sponsored the Händel festival syne 1978. The ceety hosted the 23rd an 31st European Juggling Conventions (EJC) in 2000 an 2008. In Julie, the African Simmer Festival is held in the ceety's Nordstadt. Markets, drumming workshops, exhibitions, a varied childer's programme, an musical performances tak place durin the three days festival. In the past, Karlsruhe haes been the host o LinuxTag (the mucklest Linux event in Europe) an til 2006 hosted the annual Linux Audio Conference. Visitors an locals watched the tot solar eclipse at noon on August 11, 1999. The ceety wisnae jist locatit athin the eclipse path but wis ane o the few athin Germany no plagued bi bad wather. ↑ V. C. Ihle, Karlsruhe und die USA (an the United States), p. 15. ↑ Rashid Bin Muhammad. "Karlsruhe-Metric Voronoi Diagram". Personal.kent.edu. Retrieved 2011-04-07. ↑ "Die Wetterstationen in Karlsruhe". Wetter.im-licht-der-natur.de. Retrieved 2013-03-26. ↑ "U.S. Military Installations". Stadtwiki Karlsruhe. Retrieved 21 July 2012. ↑ Elkins, Walter. "U.S. Army Installations - Karlsruhe". U.S. Army in Germany. Retrieved 21 July 2012. ↑ Staatliche Majolika Manufaktur Karlsruhe GmbH. "Majolika-Manufaktur". Majolika-karlsruhe.com. Retrieved 2011-04-07. ↑ "Financial Report 2012" (PDF). EnBW. p. 3. ↑ "Jewish Community Karlsruhe - Karlsruhe, Germany". ↑ "Karlsruhe condolence book". Karlsruhe.de. 2006-12-20. Retrieved 2011-04-07. ↑ "Eingliederung ehemals selbständiger Gemeinden". Amt für Stadtentwicklung (in German). Stadt Karlsruhe. 2010-06-07. Retrieved 2011-01-05. ↑ "Partneri- ja kummikaupungit (Partnership an twinning cities)". Oulun kaupunki (Ceety o Oulu) (in Finnish). Retrieved 2013-07-27. ↑ "das FEST" (in German). Retrieved 2011-01-05. ↑ "Karlsruhe Afrikamarkt & Festival 2011". Africansummerfestival.de. Retrieved 2011-04-07. Wikimedia Commons haes media relatit tae Karlsruhe.